Dr.Malpani's Blog: Fresh or frozen embryos: Which is the better option ? Fresh or frozen embryos: Which is the better option ? The decision of whether to use fresh or frozen embryos for IVF has become a contentious issue only recently. In the past, the decision was easier and fresh embryos were the best option for many years. This is because the procedure for freezing embryos was not well developed enough, which meant that the quality of the frozen embryos after thawing was often poor. This is why the success rate of IVF with fresh embryos was much higher than with frozen embryos in the past. 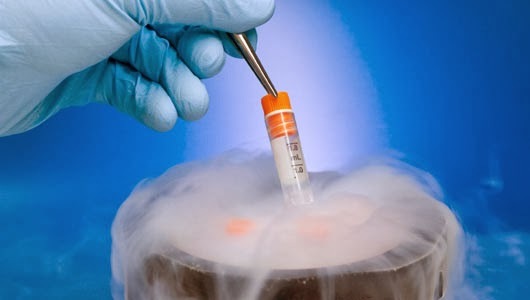 With time, the medical technology has developed newer and better techniques for freezing the embryos. Initially, the viability of the embryos was lost during the slow freezing protocol. The blastomeres were damaged due to ice crystal formation , which could not be prevented by the cryoprotectant chemical used. The recent advance in technology has lead to the use of the vitrification method for freezing. This ultra-rapid flash freezing technique means that the survival rates of embryos after thawing are much higher – and is nearly 100% in our IVF lab today . An IVF cycle requires super ovulation by the use of hormonal injections to induce ovulation. This process has an adverse effect on the lining of the uterus, and the chances of embryo implantation are reduced when the uterine lining is suboptimal. This is why , in some patients, super ovulation can reduce chances of IVF success in a fresh cycle. This is why, in recent times, natural cycle IVF and mini IVF have gained importance. We do not need to transfer all the embryos in a single cycle of IVF, but just 1 or 2 at a time. The rest of the embryos can be successfully frozen for use later on. These frozen embryos can be thawed and transferred in a cycle when the endomterium is optimally receptive. When we use frozen embryos, we can improve the chances of implantation by focssuing in preparing the uterine lining. This is why the transfer of frozen embryos in subsequent cycles is patient- friendly and cost effective. However, you do need an experienced embryologist to handle the embryos with care. The embryo freezing protocol followed at the clinic is also of importance, and smart patients will insist that the IVF clinic provide them with photos of their embryos after thawing, prior to transfer.